One of the most common questions I'm asked by readers after a $25 Shopping Cart post is, "What can you make with what you bought?" On most of these posts, I make a short list of different dishes I can make with the goods from my shopping trip and what I had on hand before heading to the store. Of course, these are just ideas; I hardly ever have a specific menu in mind since I'm the type that likes to let the food in my kitchen inspire me, so even if it sounds good at the time, I might end up making something completely different. But when it comes to the farmer's market edition of these special shopping trips, I really throw caution to the wind and let the produce tell me what new form it should take. From stir-fry dishes to salads, desserts to batches of steaming hot soup, there is no shortage of ideas for how to use the freshest fruits & veggies. Which is why it was so easy to incorporate the produce I found during my last trip to the farmer's market into my simple but elegant Easter brunch last week. I'm a big fan of colorful dishes, particularly when I'm planning a full menu, so I thought it would be nice to have something vibrant on the table to complement my Baked Eggs & Herbs in Portabella Mushroom Caps. I immediately thought of the white, yellow & orange baby carrots I'd recently purchased, and decided they'd go perfectly with some vibrant green asparagus. Keeping with the theme of simplicity, I just roasted the vegetables and whipped up a quick, flavorful chive butter to serve alongside them. This is a beautiful side dish to serve all spring & summer long, and the butter can be used on any number of vegetables, depending what's in season. It would even go well melted over thick cuts of steak, or over some tender salmon. 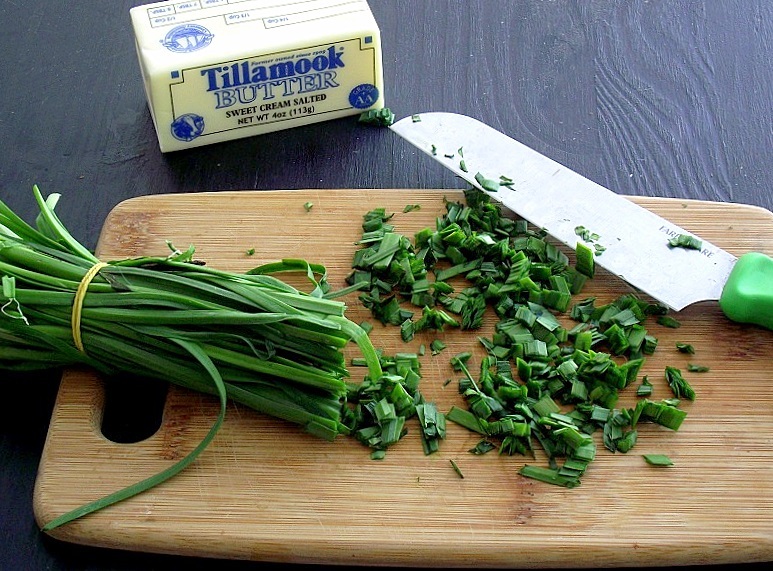 Warning: this chive butter is extremely addicting, so proceed with caution! Preheat the oven to 400°. In a small bowl, cream the butter, salt & pepper together in a small bowl until smooth. Add the chopped chives and gently fold into the butter until completely incorporated. Cover with plastic wrap and chill in the freezer until ready to serve. Prepare a baking sheet with aluminum foil. Rinse the asparagus & cut off the woody ends at the bottom of the stalks. Rinse & peel the carrots, leaving the tops on but cutting off the bottom tips. Gently toss the asparagus in the olive oil and sprinkle with salt & pepper. Roast in the oven for about 15 minutes, or until the tops of the vegetables begin to brown. Remove from heat and place on a plate. 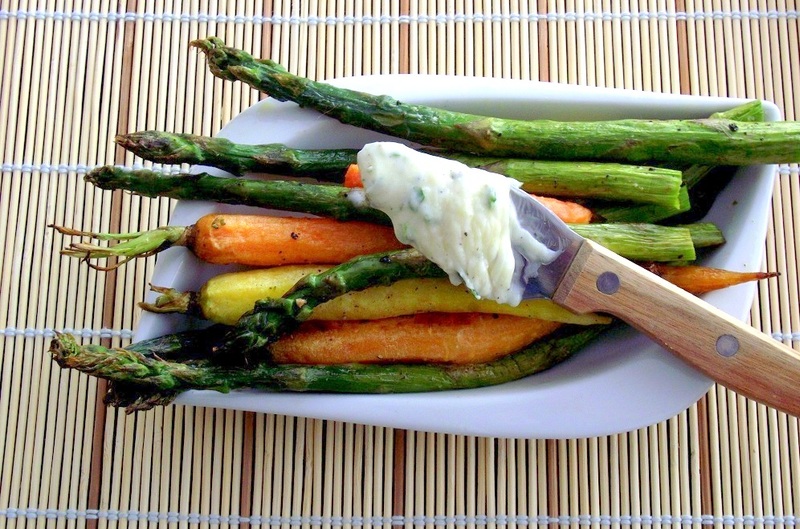 Take the chive butter out of the freezer and place about 1-2 t on top of the veggies. Allow the butter to begin melting, sprinkle with another dash of salt & freshly ground black pepper, and enjoy! I've been playing around with herbed butter myself, chives is the best so far! Lovely post. 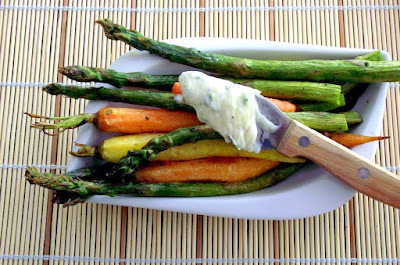 Two of my favorite vegetables together...Your addition of chive butter sounds yummy! I'm going to try it using reduced-fat butter. I neeeed to do something with asparagus before it's out of season! 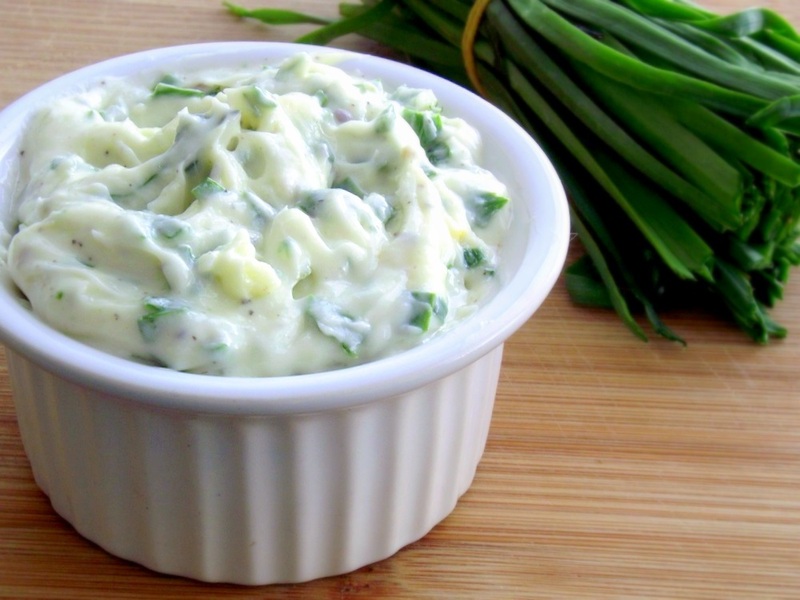 This reminded me of this Chipotle Scallion Butter that I absolutely love. I can't believe how long it has been since I made it! Thanks! This is my kind of side dish!